Theoretical Computer Science is concerned with rigorously quantifying the computational constraints on processes. Commonly, theoreticians analyze the runtime, space requirements or communication requirements of algorithms for given computational problems; devise new algorithms; or show lower bounds on the inherent resource requirements of problems. Beyond these types of problems, however, theoreticians also study the limits of computation by quantum devices, evolutionary processes, economic markets, and more. The theory group at CMS takes the widest possible view of computation. 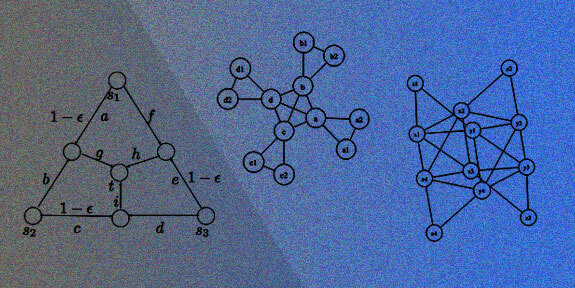 Not only do we study the complexity of fundamental problems from linear algebra, such as matrix multiplication, or graph theory, such as routing problems. But we also take at heart to expand our horizon much beyond the study of classical models. Building on close collaborations with Caltech’s research groups in quantum information, chemistry or biology we pursue the computational theory of physical systems: what kind of computations can a quantum system, a chemical molecule, a biological cell, or an abstract social network, perform? What does answering this question tell us about the underlying system? ACM/EE/CMS 116. Introduction to Stochastic Processes and Modeling. CS/SS 152. Introduction to Cryptography. ACM/EE/CMS 170. Mathematics of Signal Processing. CNS/CS/EE 188. Topics in Computation and Biological Systems.